Yay!! It’s election day today in the United States! Though as a Canadian in Toronto, I won’t be participating in this particular democratic process, like much of the rest of the world, I’ll be watching with great interest to see how it unfolds. And unlike the psychic squirrel in the CNN clip below, I’m not going to try to predict the outcome. I did, however, ask the cards what they had to say about getting out to vote (something I encourage all my American friends to do). The card I got was the 3 of Pentacles. In it, an artisan stands on a bench and displays his work for a priest and an architect. They, in turn, seem to be passing judgment on how well the artisan has been following the plans they hold in front of them. Normally I see this card as describing a growing mastery in one’s work, where people in authority recognize and often reward the technical and spiritual skills of the querent. Today though, when I look at this card, I’m thinking that the priest and the architect represent the two candidates, each trying to convince the worker to choose him. The whole story is turned around a bit in the voting scenario, but the main theme of the card remains. Mastery is still at issue, but now it is up to the artisan (or worker) to judge whose plans are best, and who should be rewarded with the mantle of leadership. 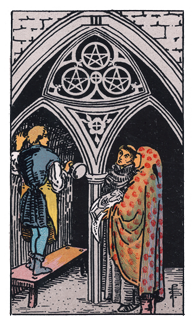 I think that the 3 of Pentacles is reminding us that getting out to vote is a practical and creative activity, where the average person gets a chance to help shape plans for the future. Don’t miss the opportunity – if you’ve got a vote, use it!! You are currently reading Voting and the 3 of Pentacles at The Tarot Room.